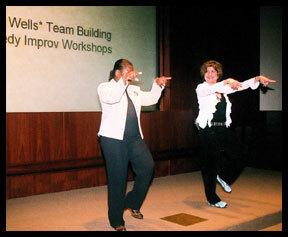 WunderWells WorkPlace WorkShops provide organizations with a creative way to emphasize leadership, communication and team building using the tools of comedy improvisation. These workshops bring fun and focus by leading attendees through interpersonal exercises making them more productive individuals and teams in the workplace – they instill and foster such skills as communication, flexibility, leadership, mutual support, creativity and acute listening… listening to understand rather than respond. Organizations who want to be more productive, hit peak performance and achieve their goals want employees to improve individually as well as build team synergy. 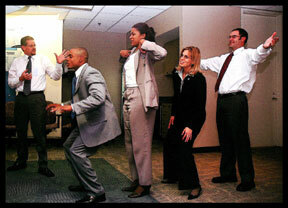 Attendees, Department Heads and your Human Resources group will love how WunderWells WorkPlace WorkShops use stage performance to emulate office performance – it’s interactive and great fun. These workshops are an ideal first day kick-off that will energize any 2-3 day department meeting including Sales Training, Leadership Development or a Department Reorganization. The focus is on improving individual and team performance where people work together toward one or more shared goals. WunderWells uses the tools of Comedy Improv to activate and engage your team. How does it work? Comedy Improv actually began on the stage. Theatrical companies needed a way for actors who had never worked together before to come together, communicate among themselves, and develop into a functioning, cohesive acting team. They all knew their individual parts, but they didn't know each other. So Comedy Improv was born. Using various "games" or exercises, the actors, the extras and the entire crew bonded together with shared goals and a common purpose. 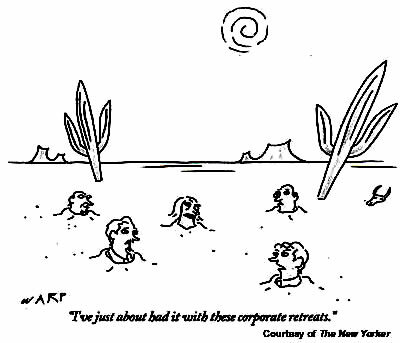 The tools used in Comedy Improv – Listening & Communication – started on the stage and have a fun, impactful translation for today’s workplace. For more pictures see Janet's Gallery. WorkPlace WorkShops are quite flexible and require very little setup - they can be held just about anywhere. Clients include: Society for Human Resource Management; Blue Cross/Blue Shield; American Cancer Society; HomeBanc Mortgage Company; NOVA Information Systems; Georgia Tech; Georgia Department of Labor (HR); MARTA Transit Authority; Ears, Nose and Throat of Georgia; Emory University; Missouri Department of Education; Various Church and non-profit organizations. Get immediate and elating results for your company leaders and employees without using the "latest trend"
About Us | Contact Us | ©2007-2008 WunderWells, Inc.